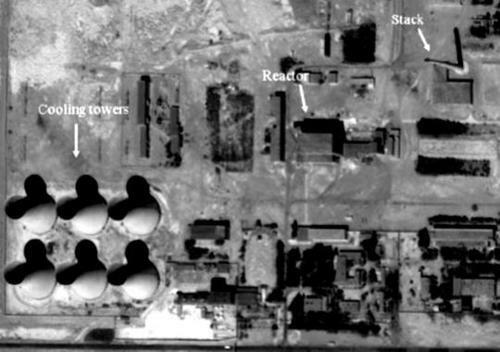 A satellite photo of China’s plutonium production reactor at Jiuquan in 2004. Several years ago, my colleague Lisbeth Gronlund and I estimated China’s production of plutonium for its nuclear weapons program. We relied heavily on a Chinese-language history of the program to reconstruct the operation of its plutonium production reactors, but our estimate had large uncertainties since we had to estimate the power of China’s second production reactor, at Guangyuan, with little good information to go on. Zhang Hui, a researcher in the Belfer Center for Science and International Affairs at Harvard, recently published a new estimate of China’s plutonium stocks, as well as its HEU stocks. By finding more information about the Guangyuan reactor, as well as getting a satellite photo of the facility, he believes he has been able to reduce the uncertainties of China’s plutonium production. He estimates that China’s military facilities have produced 2 ± 0.5 tons of plutonium, of which about 0.2 tons were consumed in nuclear tests, and 20 ± 4 tons of HEU, of which about 4 tons were used for nuclear tests, naval reactor fuel, etc. His estimates are at the low end of previous publicly available estimates of both Chinese HEU and plutonium production. For example, our estimate of plutonium production was 2-5 tons, where our upper bound took into account the possibility of a considerably larger production reactor at Guangyuan than Zhang Hui argues was actually built. A 1999 Department of Energy estimate that became public gave China’s weapons plutonium stockpile as 1.7-2.8 tons. Such low numbers are interesting since they show that a potential nuclear expansion by China is constrained by its fissile material stocks. For example, if you assume 4 kg of plutonium per weapon and that China produced 2 tons of plutonium and used 0.2 tons in tests, China could build a total of 450 warheads. This means that China doesn’t have enough plutonium to quickly try to reach parity with U.S. and Russian nuclear forces, as some people argue China would like to do, and would instead have to restart plutonium production. Moreover, if correct, these numbers give some insight into the link between U.S. missile defense plans and other things the U.S. cares about, like a Fissile Material Cutoff Treaty (FMCT). While China has stopped producing fissile material for weapons, it does not appear eager to formalize that situation. For example, it is not pressing for FMCT negotiations, which Pakistan has been blocking. China is concerned about future U.S. missile defense deployments, especially in light of U.S.-Japan cooperation on developing new generations of the sea-based SM-3 missile defense interceptor. These concerns likely have some Chinese officials arguing that China should keep its options open for producing additional fissile material for weapons in case it decides to increase its arsenal in response to missile defense deployments.